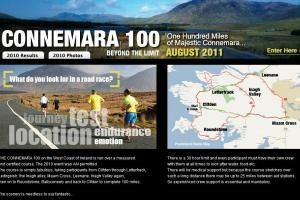 Taking place during the weekend of August 10th 2019, the Connemara 100 is best described as a 100 mile tour of Connemara on foot. The course is simply fabulous, taking participants from Clifden through Letterfrack, Leitirgeish, the Inagh valley, Maam Cross, Leenane, Inagh Valley again,then on to Roundstone, Ballyconeely and back to Clfden to complete 100 miles. Starting in the centre of Clifden, the course travels north and east towards Letterfrack turning left to Tully Cross. Along the north west Connemara sea side the course travells through Lettergesh and then south towards the main Leenane to Clifden road. A few miles west brings participants onto the Inagh Valley to cover the Connemarathon Ultra course in reverse. A second trip through the Ingah Valley and this time turning westwards along the main Galway to Clifden road. Taking the early road to Ballynahinch, the final stretch passes through Roundstone and then Ballyconeely before returning once again to Clifden for a few quick laps of the town and under the finish.